NYC DOT: Possibly the most innovative government agency in the U.S., New York City’s Department of Transportation closed several miles to cars in their annual Summer Streets program last year, and made Times Square and Broadway Boulevard pedestrian only this year. What’s next?! Daimler AG: Daimler launched Car2go, the car sharing service people always wanted, where you can pick up from one spot and drop it off at another. Featuring Smart cars, the program will launch in Austin, Texas. Bikestation: Bikestation is part of a larger ‘third place for bicyclists‘ trend already part of everyday culture in Europe and Japan, where people can store or repair their bikes and take a shower. Humana: Bike sharing is prevalent throughout Europe, especially in Paris, and Humana, Trek and creative agency Crispin Porter + Bogusky have designed the B-Cycle system for the U.S. with expectations of 50,000 bikes in a dozen cities within three years, starting in Denver. Metro Design: Create a Cooler Alternative – There’s probably no better designed public transportation campaign than that of Los Angeles’ Metro system, thanks to the award winning work of Metro Design Studio. Volvo Group: Motivate With Measurements – Track your carbon emissions with a CO2 pedometer. Though not yet available, beta users end up reducing their emissions by 30%. The next step is to take this government and corporate momentum from transportation to placemaking. 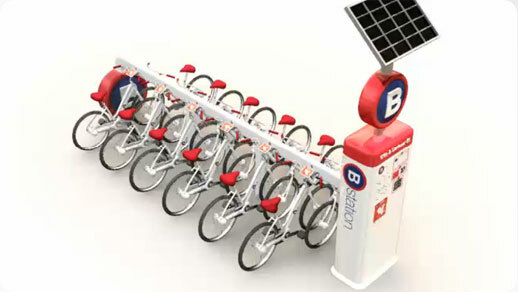 Image: B-Cycle bike sharing system.